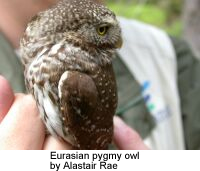 The Pygmy Owls are members of the genus Glaucidium. Several of these species are commonly referred to as "owlets." Pygmy Owls mostly feed on insects (moths, spiders, grasshoppers, beetles, locusts, mantids, fly larvae, cicadas and centipedes), and occasional small rodents, birds and lizards. Pygmy Owls are the smallest owls in the world - the size varying by species. Pygmy Owls are cavity nesters, often taken advantage of existing tree cavities - often excavated by other cavity-nesting birds / animals.